Hawkins’ Quality Manager, Khubaib Asadullah, recently wrote an article for the Chartered Quality Institute’s website titled, “Five Steps: Transforming Your Risk Register into a Quality Manual.” Khubaib joined Hawkins in 2015, and he is based at our Bristol Office. His article is now a featured technical resource on the CQI website, which is the official body that offers Chartered Quality status to individuals all over the world. In his article, Khubaib lists five steps to comply with standard ISO 9001:2015. The International Organisation for Standardisation (ISO) is a non-governmental body which has created requirements for a quality management system that can be applied to any company or organisation. 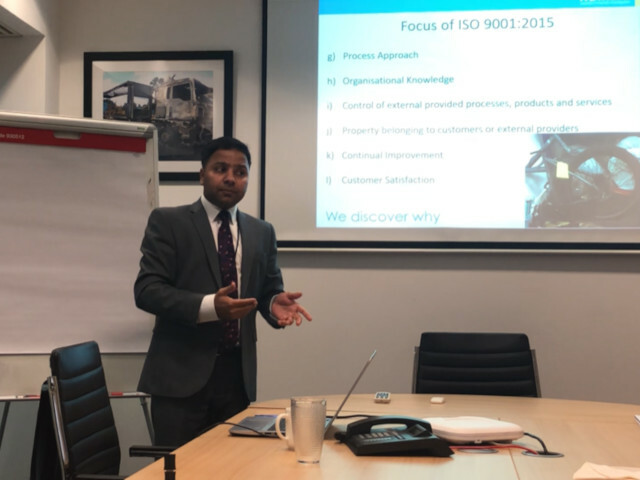 Risk prevention and quality management are often intertwined, and Khubaib has given many presentations within Hawkins, as well as externally, about how to mitigate risks and ensure quality throughout an organisation. 2. Remember the Pareto Principle: roughly 80% of the effects come from 20% of the causes. 3. Does the risk list make sense? To read the full article on the CQI website, click here. And if you have any questions about quality management, or would like to schedule a presentation from either Khubaib, or a forensic investigator at your office, please contact us.